Archaeologists in Poland announced this week that they have discovered a fragment of flint in a 25,000-year-old mammoth bone, confirming the assumption that early humans did hunt mammoths. 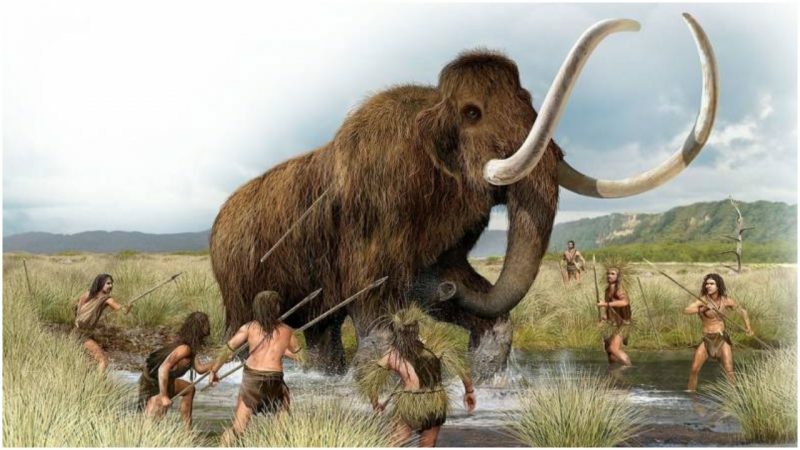 Speaking to Science in Poland, Dr. Piotr Wojtal, one of the archaeologists that worked on the project, suggested that the find offered crucial evidence to support current theories about the ways in which hunters targeted mammoths during the Ice Age in Europe. Although mammoth remains found in other parts of the world have indicated that humans may have hunted them, this discovery provides concrete evidence and is the first of its kind in Europe. The presence of a flint arrowhead embedded in the rib of a woolly mammoth can tell us a great deal about the hunting practices of our early ancestors. The woolly mammoth is one of the most iconic creatures of prehistory, and is thought to have been extinct for around 10,000 years. It is particularly known for its long, shaggy fur and enormous tusks, which gave it considerable advantages when foraging for food. Mural depicting a herd walking near the Somme River in France by Charles R. Knight, 1916, American Museum of Natural History. Humans and mammoths coexisted for a long period of time, and early humans made use of mammoth furs, bones, and tusks for clothing and shelter. Many cave paintings dating from 35,000 and 11,500 years ago depict mammoths in a variety of styles and sizes. One of the great debates in the field of archaeology centers on the reason for mammoth extinction in the early Holocene period. Scientists are divided over whether climate change was the cause of dwindling mammoth numbers, or whether these animals were hunted to extinction by humans. Many scientists have suggested that human hunting of mammoths was limited, but this new discovery may challenge this viewpoint. The mammoth bone was found as part of a larger dig near Krakow, southern Poland. This site was first discovered in 1967 and according to Science in Poland, the remains of around 110 mammoths have been found there. 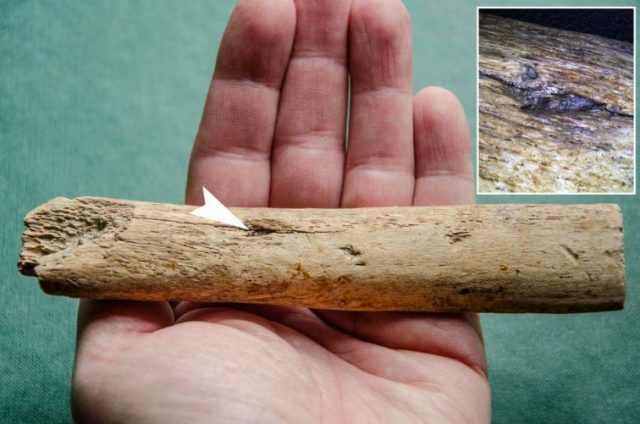 More recently, however, the researchers working on the bones discovered a small flint arrowhead embedded in a large adult mammoth rib bone. In addition to this, they uncovered several hundred flint blades alongside the mammoth bones. 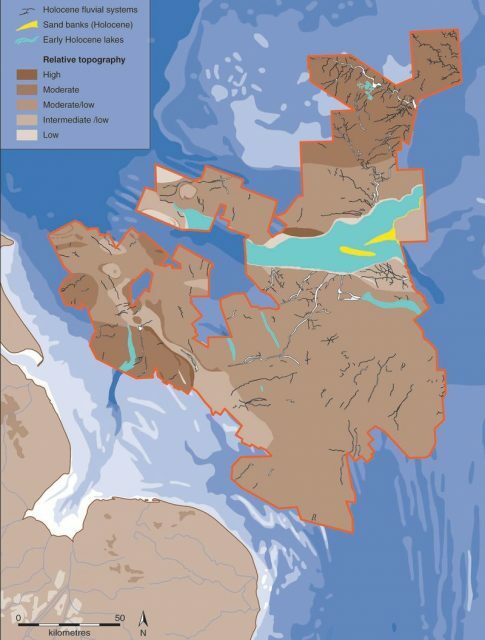 The density of the finds would seem to indicate that this was a popular area for mammoth hunting, perhaps because the topography of the region allowed humans to trap and kill these large beasts relatively easily. Previous studies have speculated that the mammoths were driven towards a cliff edge, forcing the animals to jump to their deaths. However, these finds suggest that hunting with spears was very common. In order for a hand-held spear to penetrate a mammoth skin, it would have needed to be thrown from a distance, with considerable force. To reach the bone, the spear would have needed to pierce a tough two-centimeter layer of skin and an eight-centimeter layer of fat. Researchers have often speculated how humans with limited means and weaponry managed to take down such strong, large and well-protected creatures. The typical woolly mammoth was around three meters tall and weighed around six tons, roughly the same size as a modern African elephant. Hunting such a creature with spears would have been a daunting prospect. 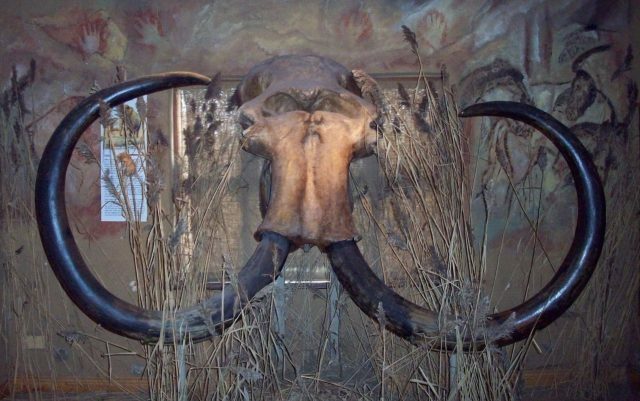 However, this find provides strong evidence that prehistoric humans were regular hunters of mammoths. It is extremely rare to find unambiguous evidence that attests to the active hunting of mammoths, and many scholars have previously assumed mammoth-human interaction was limited to scavenging deceased mammoths for fur, ivory and bones. The presence of a flint arrowhead in a mammoth bone is powerful evidence that humans played a far more active role in hunting and killing mammoths than has previously been assumed. The discovery also provides new clues about the reasons for the demise of the woolly mammoth between 15,000 and 10,000 years ago. Although climate change undoubtedly played a significant role in pushing the woolly mammoth to extinction, the human contribution to the decline in numbers in the early Holocene period cannot be ruled out.